Very welcoming. makes you want to go through the gate and explore . Makes me want to see what's on the otherside and around the next corner. Very lovely ! This makes me think of 'The Secret Garden'. A lovely photo! What a lovely photo of a very inviting open gate! Cozy and inviting. Love it! Love your picture so enticing, such a great design for a gate. sorry I missed this, Sarah, but better late than never aye?... That looks so beautiful and inviting...Those rhodos! I'm green with envy...lol. won't be much longer and they will be looking this way again...? Sadly, the Sappho in this picture got a fungus last summer and is no more. Very sad as it was huge and gorgeous in bloom. Our spring is delayed this year but the rhododendrons have started slowly. The second earliest is in bloom right now. My single rhodo which bloomed last year has no buds this year and the foliage is brown and curled...I'm hoping that with some warm weather it may rebound...but must say I'm feeling less than optimistic. Rhodo story for you, Sarah65. 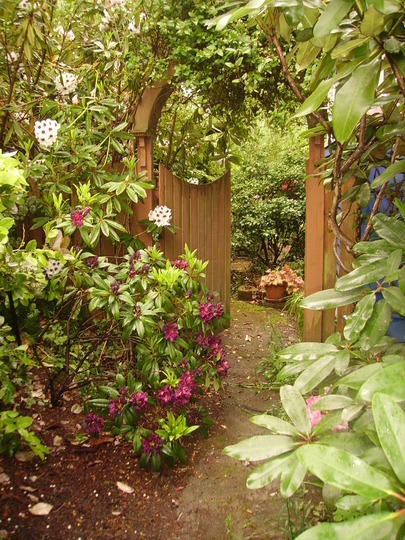 the rhodo I mentioned above looked at death's door.... Although it seems unrelated, last Christmas we bought our first real tree in years, when it had served as bird sanctuary in the garden thro the last of the winter it dried and died off to brown this spring. When it was resinous smelling (balsam fir) I mulched the outer limbs with the lawn mower and it made the most wonderful mulch....put that under my rhodo and whatever was munching the leaves disappeared! it has healthy looking leaves but did not bud up...I'm hopeful for next season though!...Christmas tree mulch... I'm proud of my recycling.